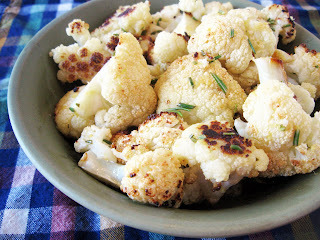 I never at cauliflower until I tried roasting it (same with asparagus). Roasted cauliflower is a pretty common side dish in the (dis)Ordered Kitchen. I haven't though to add rosemary. I will give that a shot the next time around for sure. I don't think we make cauliflower any other way these days! Do try it with the rosemary... so good. Definitely let us know what you think if you try it! This looks/sounds wonderful. I'm making this for our Easter dinner. Can't wait! Robin - Please check back and let us know how you liked it! Whole Foods was out of fresh rosemary, so I had to settle for dried; next time I will wait until I have the fresh in hand. I will also use less lemon; one entire lemon overpowered the dish. 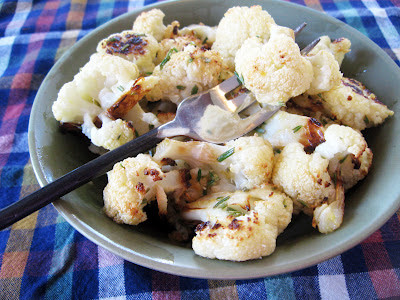 The cauliflower roasted beautifully and the brown butter was wonderful. This one's a keeper. Thank you! Thanks for the feedback! More specific measurements on the lemon would probably be useful here, as each lemon contains a variable amount of juice. We made this again for Easter dinner, and found that about 3 tablespoons of lemon juice seemed to work well when balanced by a bit of salt. Tried this tonight. I loved it and 5yrold asked for thirds. Definitely a keeper. I followed the recipe but halved it because I only needed to serve three, and I served it as a side with grilled fish. If I don't roast them I mix them with different vegetables like bell peppers with a little olive oil or butter.